Valle d’Aosta is the dwarf, size-wise, among Italy’s 20 regions, but it’s a giant when it comes to quality. Thirteen unique native grape varieties and a half dozen international grapes, the region’s complex geology and alpine climate, and the area’s many passionate, talented producers combine to produce a selection of white, red, sparkling and sweet wines of remarkably high quality in all but the most difficult vintages. Nestled against Italy’s border with France and Switzerland and situated high in the Alps, Valle d’Aosta is, at about 1,260 square miles, Italy’s smallest and least densely populated region. And because Valle d’Aosta was under French rule at various times throughout its history, family names such as Gerbelle and Charrère are more typical of the region than the Bianchi, Rossi or Verdi last names that common throughout the rest of the Italy. You’re also just as likely to find pomme (apple, in French) on a menu as you are mela (which again means apple, but in Italian). Much of the native population (especially the older generation) also speaks Valdôtain, or Patois, a dialect of Arpitan (of Franco-Provençal origin). Sadly, the younger generations are losing some of that linkage with the past. In the end, what matters most is that Valle d’Aosta is one of the most beautiful places in Italy, its waterfall-rich countryside dotted with numerous well-kept ancient Roman sites and medieval castles, and upper reaches of the area literally blanketed with towering evergreen forests. Not surprisingly, the region boasts some of the country’s best ski resorts. For those who enjoy winter sports, names like Courmayeur and Cervinia are just as famous as Gstaad, Chamonix, Whistler and Aspen. Over the last ten years (2005-2014) wine production in Valle d’Aosta has ranged from 16,800 to 22,000 hectoliters per year. Only in the strongly weather-challenged 2014 vintage did production volume drop nearly to an all-time low, about 14,500 hectoliters. If Valle d’Aosta’s wine volume declines from time to time due to vintage vagaries, the high quality of its wines rarely wavers. As a result, the value of the region’s wine production has been steadily increasing (up 59.3% over the last five years, compared to a 43.3% increase for wines from the rest of Italy over the same time period), from roughly 14 million Euros in 2008 to 22 million Euros in 2014. More so than almost any other region in Italy, Valle d’Aosta’s wines are mostly of the (supposedly) higher-quality DOC level. From a ten-year low of 55.7% in 2005, DOC wine production increased in 2012 to 95% of Valle d’Aosta’s total wine output. In other words, Valle d’Aosta is not the place to look for buying must or bulk wine. In fact, Valle d’Aosta’s problem is not the quality of its wines but their very limited quantities, as many estates make fewer than 10,000 bottles of wine per year. At last estimate, Valle d’Aosta has 463 hectares under vine (but note that the region featured roughly 3,000 hectares before phylloxera struck here at the beginning of the 20th century), of which 301 hectares are DOC vineyards. Most of the wine estates in the region are very small family-run affairs. Approximately 67% of those who grow grapes in Valle d’Aosta own 0.2 hectares of vines or less! Clearly, this makes it difficult for the region and its producers to gain much notoriety beyond local borders. At 74 hectares and 44 hectares respectively, Petit Rouge and Picotener (the local name for Nebbiolo) are the two most planted grape varieties in Valle d’Aosta. The most planted white grape, Prié, ranks a distant third (29 hectares) on the Valle’s list of varieties. Pinot Noir, Fumin, Chardonnay, Petit Arvine and Moscato Bianco are the next most planted varieties. In fact, Lilliputian Valle d’Aosta turns downright Brobdignagian thanks to its plethora of high-quality native grape varieties that have the potential to make outstanding wines. Grapes such as Cornalin, Mayolet, Prëmetta, Prié and Vuillermin can be found only in this remote alpine neck of the Italian woods. Over the last 15 to 20 years a few of Valle d’Aosta’s varieties have become somewhat better known (in Italy, at least). For example, Petit Rouge, Fumin and Nebbiolo stand tall among its reds. Petit Rouge is a workhorse grape that can give lovely everyday quaffing reds that are very much in the style of a good fresh Valpolicella or Chianti, but this variety can aspire to something a great deal more ambitious when it’s grown in the heart of the historic Torrette growing area. Parts of the Torrette denomination are true grand crus for this variety, but the denomination has been extended too far in the modern day, as so many are. Fumin produces inkier wines with more herbal flourishes, but, being a highly reductive variety, it needs to be vinified carefully or off-aromas can easily appear. Fumin has long been viewed as Valle d’Aosta’s finest red grape and its wines can age splendidly (make sure you don’t miss my forthcoming Les Crêtes Fumin vertical). Of course, Nebbiolo is not unique to Valle d’Aosta, but it has found a real home in the areas of Donnas and Arnad-Montjovet (sybarites might like to know that Valle d’Aosta’s lard of Arnad is just as good as – if perhaps a little less famous abroad than – Tuscany’s lard of Colonnata). Valle d’Aosta’s Nebbiolo wines speak of their mountain heritage. Steely and highly perfumed, they lack the flesh of Barolo and Barbaresco (and unlike those wines, they do not need to be 100% Nebbiolo; they often contain small percentages of other local grapes) but the best examples offer a very refined mouth feel. To my taste, the most interesting native wine grapes of the region are, in alphabetical order, Cornalin, Mayolet and Vuillermin. Cornalin gives perfumed red wines (common descriptors for these wines include violet, red cherry and tobacco) that have structure but also good freshness. Mayolet is an absolute gem, a lightly aromatic red grape that gives light-bodied wines with remarkable purity and floral charm. Unfortunately, its very compact bunches mean that it can be a rot magnet in wet years and consequently many farmers are giving up on it (an absolute tragedy, in my view). Vuillermin may be the best of this trio of native red wine grapes. It’s also a lightly aromatic variety (but less so than Mayolet) and it produces much more structured and age-worthy wines. Prëmetta is another local red grape that yields lovely pale, floral red wines – almost like natural rosés, if you will. And in a clear sign of Valle d’Aosta’s attention to, and passion for, its natural wine grape bounty, Roussin de Morgex, an almost extinct red grape that gives high-acid, pink-colored wines, is being slowly nurtured back to prominence by the Cave Mont Blanc, the cooperative that produces roughly 95% of the Alta Valle’s wine. The first wines I have tried (only three vintages thus far) have revealed it to have extraordinary potential for making rosé sparkling wine. Last but certainly not least, the only native white grape of Valle d’Aosta is Prié (often erroneously called Prié Blanc), from which producers in the highest, northernmost reaches of the region make the lovely Blanc de Morgex et La Salle, a delicate, perfumed wine (in both still and sparkling versions) that is not only a great match with many freshwater fish and vegetable dishes but is also one of Italy’s best aperitifs. What is most interesting about Valle d’Aosta is how well some international grape varieties perform. Wines made from Pinot Gris, Pinot Noir, Müller-Thurgau, Chardonnay, Syrah and Gamay rank among the best in Italy from their respective varieties. All of the red wines made with these grapes are characterized by perfumed aromatics, fresh flavors, high-acids and light to midweight frames. To cite just one example: Valle d’Aosta’s Syrahs are nothing like the chunky (and usually) charmless wines made elsewhere in the country (given the profile I just described, you might say they have more in common with Côte-Rôtie than with Cornas). The Pinot Noirs are delicate, usually very pale red in color, tart and light-bodied. At times, they have more in common with Gamay than they do with top Pinots from Burgundy or Oregon. In fact, Valle d’Aosta also makes Italy’s only worthwhile Gamays – but don’t confuse them with Umbrian wines made with Gamay Perugino, as the latter variety is actually a local biotype of Grenache. As interesting and good as the region’s red wines may be – and perhaps become in the future thanks to climate change – it is the region’s white wines made from international grapes that really draw applause. Though Valle d’Aosta’s Chardonnay wines are certainly not immune to overoaking (a bad habit in Italy when it comes to its Chardonnays), they are much better than most of the others made in the country. Many, but not all, Chardonnays from Valle d’Aosta are minerally and lemony, balanced and refined. 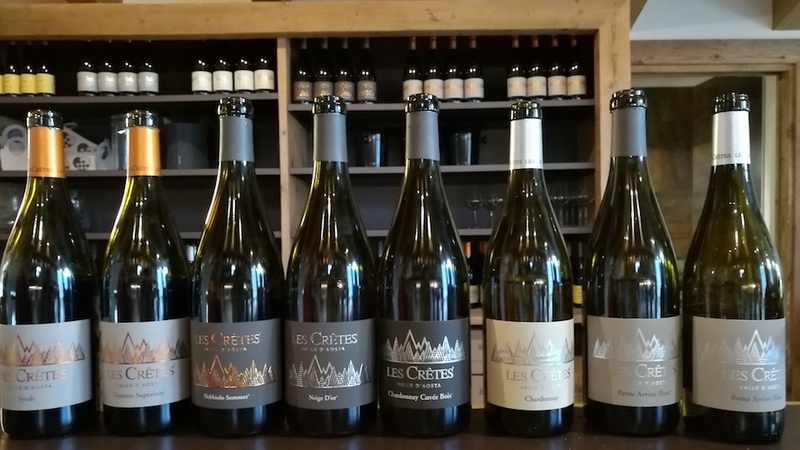 But it’s the wines made with Pinot Gris (the region’s French roots show: nobody in Valle d’Aosta refers to this grape and its wines as Pinot Grigio) that can be truly exceptional, especially when the grapes are grown at higher altitudes. Unfortunately, at last official count, there are only 15 hectares planted to Pinot Gris in the region, which means that you’ll be extremely unlikely to find these wines in your neighborhood wine store. In any case, Valle d’Aosta Pinot Gris show archetypal orchard fruit aromas and flavors, and boast uncommon depth. Remember not to miss out on the few Müller-Thurgaus still being made if you visit. Because Müller-Thurgau is tragically unfashionable, plantings have been decreasing inexorably over the last 20 years, which is a real shame. In fact, there have been many lovely Valle d’Aosta Müller-Thurgaus made over the years, if for no other reason than that the region’s high-altitude mountain vineyards provide a perfect habitat for this variety. Last but certainly not least, Valle d’Aosta is the home to Italy’s only Petite Arvine. A native of Switzerland, Petite Arvine has adapted remarkably well to its new Italian home (the variety was planted only recently in Valle d’Aosta, beginning in the 1990s). It gives delicious medium-bodied wines with floral and honeyed notes that linger impressively. Simply put, you will never go wrong when choosing a Petite Arvine wine from Valle d’Aosta. Valle d’Aosta can be divided into three sections, the Bassa Valle (the low valley), the Media Valle (the central or middle valley), and the Alta Valle (the high valley), which correspond to the lower, middle and upper thirds of the region. The Dora Baltea river runs through all three valleys and vines grace both of its banks, although most of the vineyards are found on the eastern, or warmer, side of the river and its tributaries. The Bassa Valle is located farther south, at the border with Piedmont; this is where Donnas and the less well-known Arnad-Montjovet denominations are found. The Media Valle is where most of Valle d’Aosta’s wine is made, as well as the site of some of the region’s best terroirs – e.g., Torrette (for Petit Rouge), Nus (for Pinot Grigio, but historically called Malvoisie) and Chambave (for Moscato Bianco). This is also where the best sites for Cornalin, Mayolet and Vuillermin are located. The Alta Valle grows almost only Prié, which used to make the marvelously delicate and refreshing white Blanc de Morgex et La Salle wine, and the still very rare Roussin de Morgex. 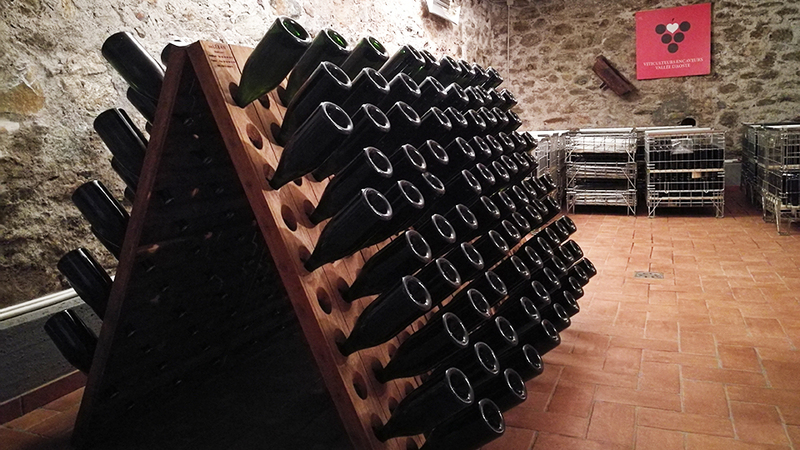 Owing to its high altitude and relatively cool microclimate, Valle d’Aosta boasts some of Italy’s most interesting sparkling wines made both by the Charmat-Martinotti (autoclave) method and by secondary fermentation in the bottle. The 2017 vintage in Valle d’Aosta was an absolute disaster from a production standpoint. There is simply no other way of describing it. 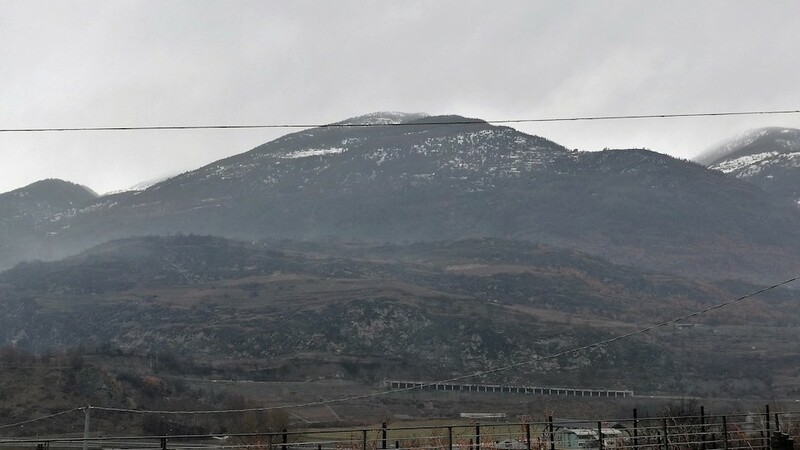 Due to heavy frost and freezing weather, wine production was down an unbelievable 70% on average in the region, ranging from as little as 40% to as much as 95% in the extremely unlucky Alta Valle. I do not use the word “disaster” lightly. Another couple of vintages like that and viticulture in large swaths of the region will require years to recover. In any case, what wine was made in 2017 is surprisingly good. This is especially true of the white wines, which have noteworthy concentration of flavor and tropical fruit notes, which are uncommon in Valle d’Aosta, The reds display a richer-than-usual palate presence as well, although rough tannins can be a problem in some wines. The 2016 vintage was very good overall, although not as strong as many producers claim it was. A relatively cool summer was followed by an ideal autumn with no rain and plenty of warmth and sunshine, leading to well-balanced white and red wines redolent of fresh fruits and flowers. While not all of the ’16s I have tasted strike me as being especially concentrated (2016 was also a very productive year, and some wines taste dilute), most of them offer considerable early appeal. By contrast, 2015 was a year marked by irregular weather patterns, with a rainy spring, serious drought conditions during summer, and then rain again in the fall. While the rain saved the vintage by relieving the vines of the serious water stress they had been subjected to during the heat of summer, I find that the majority of wines lack a little balance. Clearly, tannins can be tough and gritty in some of this vintage’s less successful red wines. Wine lovers need to be aware that the 2014 vintage was much less marked by rain in Valle d’Aosta than in other parts of Italy, and so the 2014 reds are on average much better than those of the rest of the country. The 2013 vintage was solid, and yielded many graceful red and white wines that offer perfume and freshness, while the 2012 and 2011 vintages were characterized by weather patterns that were much like those across the rest of Italy – meaning that they were generally hot years. Although some 2011 and 2012 Valle d’Aosta wines are marred by cooked flavors, high temperatures aren’t necessarily a bad thing in coolish Valle d’Aosta (drought is actually the main challenge for the region’s viticulture) and many of the red wines, especially, are delightfully rich and fuller-bodied than usual. 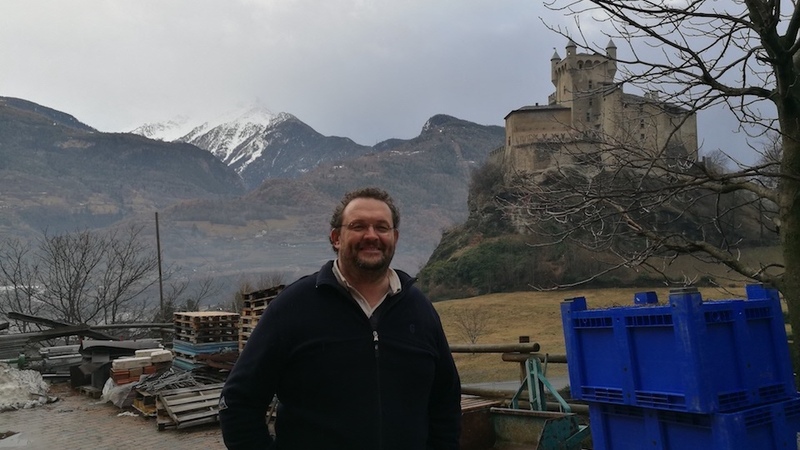 I tasted the wines reviewed in this article during my winery visits in Valle d’Aosta in late January and February of 2018, and in April and May in my offices in Italy.